Want to create your first quiz – but aren’t sure what type? Quiz: A series of ‘right/wrong’ questions, your users will get a ‘You got X out of Y correct… You’re <result name>!’ type result. Tap and find: Get your audience to search, tap, and find answers in images. Two fun modes: ‘image search’ and ‘spot the difference’. 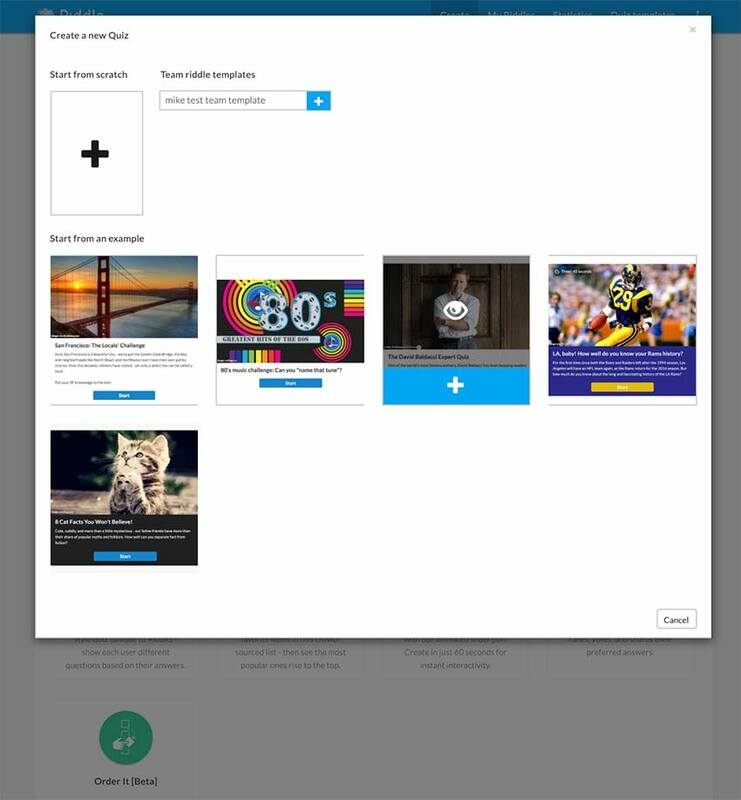 Order it: Challenge your audience to arrange quiz items in correct order (ex. (“Arrange Star Wars movies by release date”). Opinion poll: Ask one question with our classic poll. Users can select their favorite answer – and see the overall results. Reaction poll: Your audience gives their opinion using a slider to express ‘Strongly agree’ (or like) to ‘Strongly agree’ (or dislike). List: the classic listicle is great for showing content in an easy-to read format (‘9 cities to visit this year’, ‘7 classic interview mistakes’). Survey: Find out what people really think – with single, multiple choice, and free text downloadable answers. Social story: Quiz meets blog post – create a rich long-form story. Embed social media, images, and other Riddle quizzes. You copy also copy any of our quiz templates directly to your account – to try out and edit to make your own. Want inspiration on how to use any quiz style? We have dozens of our own quiz templates that you can use – simply copy any of our own template Riddles directly to your account.